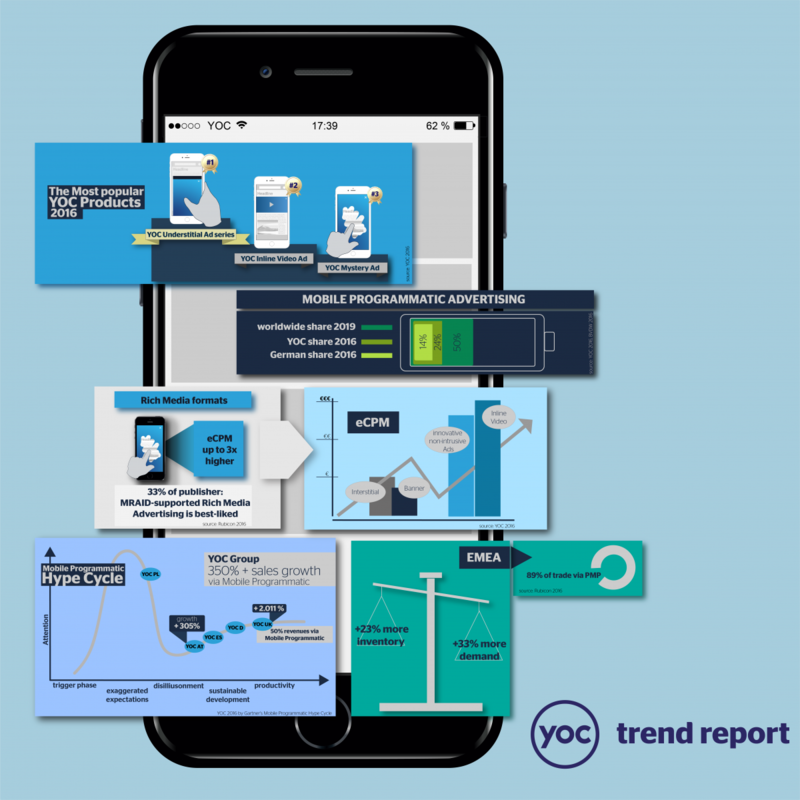 Berlin, 17 January 2017 – In the second part of its trend report YOC AG shows the level of advancement of the mobile programmatic trade in its locations in Germany, Great Britain, Spain, Austria and Poland. For this purpose, the provider of product based mobile advertising refers to the so-called Gartner Hype Cycle of Programmatic. The model classifies the integration of mobile programmatic into different process phases, starting with the trigger phase, and ending with the productivity phase. The German market comes second in regard to the revenue generated through programmatic sale. The inventory traded through this channel accounts for one third of the total revenue, according to the analysis. This figure is also reflected in the advertisers’ spending. “The uncertainties towards the automated sales channel have decreased significantly in the past year. In particular as, aside from the standard formats, we are also able to provide our self-developed advertising products such as YOC Understitial Ad® programmatically”, says Jan Gräwen, Country Manager YOC Germany. The internal analysis at YOC revealed that the Spanish market is set for mobile programmatic: Publishers have accepted the advantages of programmatic business and made their inventory available accordingly. All large media agencies are connected with trading desks and operate on the basis of direct deals, private marketplaces and in the open marketplace. Here, the unsteady phase of exaggerated expectations as it is called in the Gartner model, is already overcome and has proceeded into a stable growth phase. Being the market leader in the mobile advertising segment in Austria, YOC generates most programmatic revenues via direct deals. The potential for the automated trade is clear: A revenue share in the double-digit percentage range and further growing interest point to rapid growth in this sector in 2017. “Aside from the standard formats we are facing in particular a great demand from our advertising clients for individual solutions, which we realise with creative rich media products such as YOC Mystery Ad® or YOC Understitial Ad®. Ever since we have also employed these formats programmatically, the interest in mobile programmatic has multiplied”, says Maximilian Pruscha, Managing Director YOC CEE Austria. The Polish mobile advertising market is still in the trigger phase, according to the Gartner model. So far, there is more talk about mobile programmatic than automated trade actually taking place. “Awareness and readiness for mobile programmatic exist on the side of advertisers, and are permanently on the rise. We are ready and only waiting for the market to catch up”, Wojchiech Nowanski, Country Manager YOC Poland, comments on the status quo in Poland. Despite the various degrees of maturity in the different locations, YOC AG expects mobile programmatic to transform the European mobile advertising market in the next 18 months to come. Great Britain, the leading market, forecasts a market share of up to 80 % – not least because YOC actively shapes the path of a product based provider of mobile advertising by developing new innovative formats and providing them programmatically.